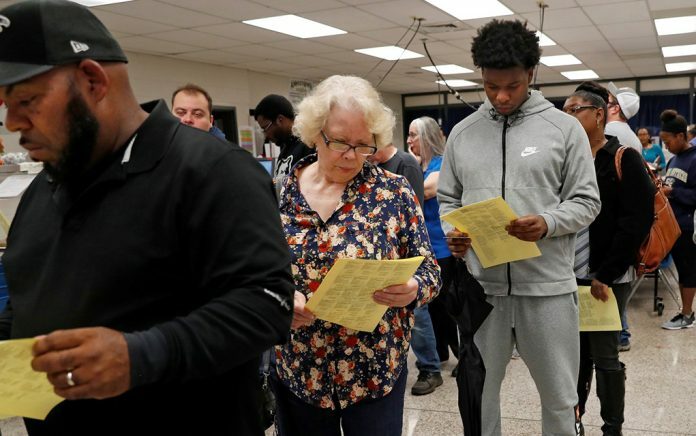 Technical issues caused long lines and forced voters to resort to paper ballots at least three Gwinnett County, Ga., precincts Tuesday morning. Gwinnett County officials confirmed that the electronic Express Polls — which are used to check voters in to their precincts — were temporarily down at both the Gwinnett Public Library Branch in Suwanee and Anderson-Livsey Elementary School near Snellville. At the latter, a line of hundreds of waiting voters stretched the entire length of the school. The Suwanee issues were resolved around 9:45 a.m. and, about 30 minutes later, Gwinnett County spokesman Joe Sorenson said the issues at Anderson-Livsey had been fixed too — while simultaneously confirming that similar problems continued at the Annistown Elementary School precinct, about four miles to the south. Sorenson said the Express Polls issue was not electrical and happens from time to time. New equipment will be brought in, he said. In the meantime, poll workers are able to use paper voter rolls and voters are able to cast paper ballots. Those ballots, which are akin to standardized testing forms, are later scanned by machines, not by people. Cheryl Strickland told The Atlanta Jourrnal Constitution she arrived at 6:15 a.m. — 45 minutes before polls opened — and was staying put at Annistown until she could vote on a machine. Tabitha Fudge was waiting too, saying she didn’t trust that paper ballots would be counted properly. Sorenson said it is the same technology the county utilizes for provisional and absentee ballots. In a contentious — and litigious — election season across the state, Gwinnett County has faced extra scrutiny. It was singled out in voting rights lawsuits due to its rejection of an inordinate amount of absentee ballots. Gwinnett — long a Republican stronghold but rapidly shifting left — is expected to be a battleground in races that will determine everything from the governor’s mansion to local commission seats. Travon Stanton waited for more than an hour at Anderson-Livsey Elementary on Tuesday morning. He said it was worth the wait.